Since its creation in the 1930s, the Federal Culinary Commission has tightly regulated the pizza marketplace. Entrepreneurs wishing to open pizzerias have been required to apply to the FCC, specifying the location of their proposed pizzeria, detailing the kinds of pizza that would be offered, and explaining how the creation of a new pizzeria benefitted the public interest. If the FCC determined that a new pizzeria was needed, it would issue a new pizzaright, subject, of course, to periodic renewal to ensure that the pizzaright was being used in the public interest. In 1959, the noted economist (and future Nobel Laureate) Donald Rose argued that this “command and control” approach was grossly inefficient. He proposed that rather than micromanaging the evolution of the pizza industry, that the FCC should auction off pizzarights to the highest bidder. This would ensure that pizzarights were allocated to their highest-valued uses, and thereby promote economic efficiency. Rose’s proposal was initially ridiculed, but over the last 50 years this free-market perspective has gradually gradually become the conventional wisdom. 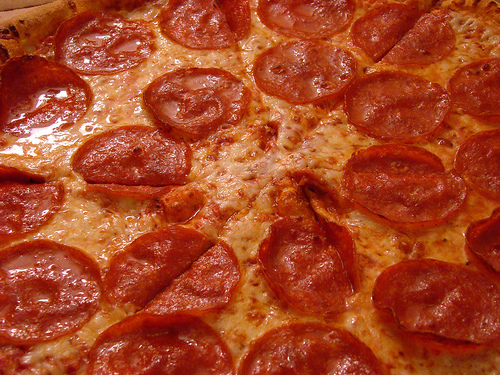 In 1994, the FCC conducted its first pizzaright auction, selling a national thin crust pepperoni pizzaright to Dominoes and allowing the firm to grow into the nation’s leading pizza chain. Over the last 15 years, Pizza Hut and Papa Johns have snapped up other key pizzarights and have built out their own national networks. Free-market economists tout the dramatic expansion of the pizza industry as evidence of the benefits of the property rights approach. And they have urged the FCC to finish the job, consolidating and auctioning off the pizzarights that are still scattered among thousands of local pizzerias across the country. Today virtually everyone agrees that the FCC’s “command and control” regime for managing the pizza industry is antiquated. But a new critique of the orthodox free-market position has arisen on the left. These scholars argue that pizzaright privatization has promoted monopolization of the pizza marketplace. These advocates of a “pizzaright commons” have argued that rather than auction off more exclusive pizzarights, the FCC should focus on allowing more pizzerias to operate on an unlicensed basis. They point to the extraordinary success of the white cheese and spinach pizzaright, one of the earliest to be made available on an unlicensed basis, and now the basis of a thriving market for “WiSpi” pizzerias. But free-market economists reject a pizzaright commons as command-and-control regulation in disguise. They point out that in practice, “unlicensed” pizzarights invariably come with strings attached. Indeed, the rules for the use of unlicensed pizzarights are often as complex and cumbersome as traditional command-and-control regulation. Free-marketeers point to the recent green spaces proceeding, which sought to allow unlicensed pizzerias in areas that were at least 5 miles from any existing pizzaright holder. The National Association of Pizzerias lobbied aggressively for additional restrictions, and the final rules were so cumbersome that not a single pizzeria has been opened under the “green spaces” regime. David W Seymore, a leading free-market pizzaright scholar who served as the chief economist at the Federal Culinary Commission in the early 1990s, also points that a pizzaright commons would make it extremely difficult to organize the pizza marketplace. Once the FCC began allowing unlicensed creation of pizzerias, the fragmentation of the marketplace would be very difficult to reverse. “What really should happen now, is that there should be a mechanism, whereby new owners come in to, in essence, have exclusive control of competitive swaths of the pizza market, and therefore have an interest in re-organizing each part of the pizza market in an efficient way,” he said in a recent interview. National pizzaright holders could buy out inefficient regional pizzerias, ensuring that pizzarights were put to their most productive use. After all, if there were really a demand for smaller pizzerias, the appropriate pizzarights could be purchased in the marketplace. Market prices, not bureaucratic fiat, should determine the optimal allocation of pizzarights. Will Wilkinson recently posted some thoughts on “liberaltarians” and how they can significantly differ in both voting choices and policy positions from more traditional libertarian types despite a common philosophical outlook. I think IP policy is definitely one of those rifts. Alright gotta run and look for a WiSpi hotspot.